Most of us spend a lot of our work day (or all of it) sitting on a desk working on a computer – whether it is a laptop, desktop, or a tablet. Here’s what you need to do create a workspace that takes ergonomic design principles into consideration. Of course, you need to pay attention to the type of input devices you use. 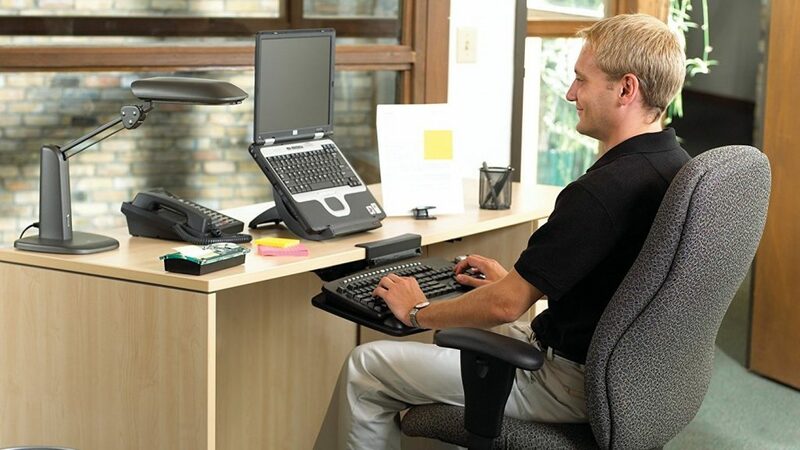 Since we have our hands on a mouse or keyboard most of the time, buying ergonomic devices make sense even though they are more expensive than regular keyboard and mice. When you’re sitting on your desk, it is important to avoid awkward postures and to position your body correctly. You should keep your shoulders relaxed and back straight with elbows close to body at a 90⁰-100⁰ angle. The wrists should be in straight line with the forearm and you should not use wrist rest areas while typing. These are for resting on when you are not typing. The top of monitor should be at the same level as your eyes, and the monitor should be about an arm’s length away. The former is a common issue with laptops replacing desktops for a lot of people. Laptops are neither designed nor used in an ergonomic fashion and can increase the risk of developing repetitive strain injuries. However, using a separate keyboard and mouse can definitely improve the comfort while using a laptop. Also, use a laptop stand to prop up the screen to eye level. The chair should be adjusted in a way so that your feet are flat on ground. I prefer to use a footrest. While it’s better to use a proper ergonomic chair, but in case you don’t want to spend much on fancier ones, make sure the one you get has support for natural back arch. There are few other tips to improve overall comfort and productivity. Take frequent breaks between work… stand up and stretch and walk around. Also, use software features like fast scrolling and touchpad gestures as well as keyboard shortcuts according to your operating system to avoid stretching your palms and lower the amount of travel.